Sci-fi plots based on paradoxes are often an enjoyable trip while it lasts but, once the run-time is over, and with the consideration afforded by hindsight, the holes soon start to appear and credibility crumbles to space dust. 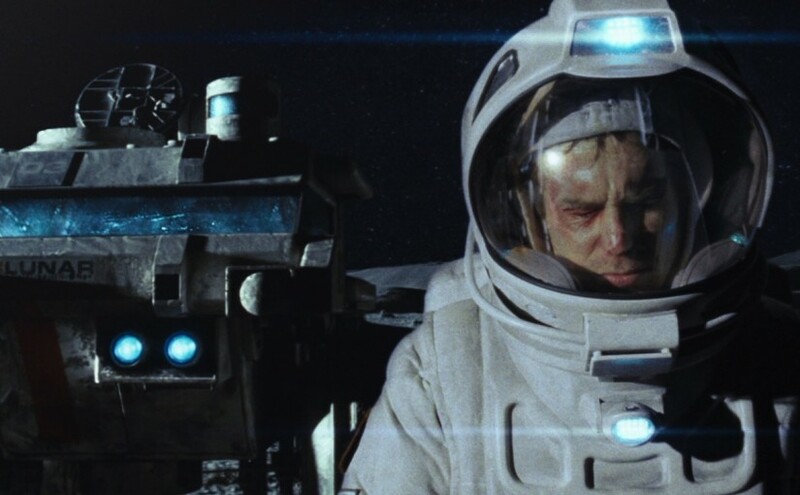 Not so in Duncan Jones’ creepy debut of lone lunar exploration. Moon is a tightly controlled Russian doll of a film that fits together with the refined intricacy of clockwork. A calm yet disquieting science fiction, its natural pace has a clean effectiveness. The potentially discombobulating plot is actually as tight as a pressurized airlock. Set in the very near future, Sam’s (Sam Rockwell) three-year mission is as sole custodian and operative of an isolated mining station. His only companion is an artificial intelligence whose prime directive is aid, accompaniment, and guarding his charge’s mental wellbeing. A set-up of such spectacular solitude is as rich for the mining of psychological contortions as the lunar surface is with the beneficial resources Sam is tasked with returning to Earth. After a while in such a forsaken environment each of us would eventually be forced to confront our darker fallibilities. Sam faces up to the (il)logical extension of this universal truth. Fundamental to the success is Rockwell’s performance. As the unfolding events require he display the multiple personalities within his character, the whole is entirely reliant on him. It is never less than stunningly realised, so convincing is his portrayal, so neatly are his plural personae stitched together in the cut. The cast list offers intriguing selections in the likes of Matt Berry and Benedict Wong, but all human contact is only ever via grainy video screen. Such is the remoteness of Sam’s plight. Primary support then comes from Kevin Spacey, but even his performance is voice-only, as the conciliatory, dispassionate robotic aid GERTY, inevitably echoing HAL 9000 from 2001: A Space Odyssey (1968). Ironically then, this is a one-man show. Within the shabby living quarters of a lone worker’s isolation, an extraordinary situation plays out with natural, everyday credibility, refreshingly lacking the pomp and bluster that would accompany such revelations in big budget Hollywood fare. We have no reason not to go along for the ride, and without even noticing it, we are soon deep down the rabbit hole where apparent impossibilities are entirely, logically plausible. Having mentioned Kubrick’s masterpiece, Moon feels descended from such lineage. It could arguably be labelled ‘serious’, ‘proper’ even ‘old fashioned’ sci-fi, reminiscent of the era 2001 ushered in. And it is a relief to see weighty, spooky, atmospheric science fiction in an age when so many entries in the genre feel lightweight and shallow due to easy over-reliance on CGI. This is contemporary cinema that feels instantly classic. A thought-provoking and subtly disturbing tale of one man being forced to travel to the dark side of the self in quite the most literal and original way. The musical dimension has a gravitational pull on this work in more ways than one. Clint Mansell, former Pop Will Eat Itself frontman, now seasoned soundtrack artist (The Fountain (2006), The Wrestler (2008), lays a perfectly pitched and beautifully haunting theme over Sam’s downward (upward?) spiral. Its refrains swell to punctuate each key moment, every time offering the listener more, neatly mirroring the revelatory hooks of the plotline. The director’s choice of surname may indicate an admirable desire to escape the burdens of his own stellar musical heritage (Jones’ father is David Bowie). But ultimately, Moon is a shiningly impressive debut by someone with cosmic credentials by birthright, being the son of the original Starman.